For decades, the U.S. has been a target for hostile foreign intelligence agencies in Russia and China. But now, officials are concerned that those adversaries are joining forces to chip away at American global dominance. WASHINGTON — For decades, the U.S. has been the number one target of hostile foreign intelligence agencies and military activities originating from Russia, China and numerous other nation-state adversaries. But now, U.S. intelligence officials are concerned that those adversaries — in a bid to chip away at American global dominance — are joining forces to target the U.S.
Coats said the challenges “span geopolitical competition, WMD proliferation, violent extremism, intra- and inter-state conflict, and regional instability.” Additionally, he said, “threats from cyberspace, and adversaries using emerging disruptive technologies,” are directed at almost every aspect of Americana. Russia and China appear to be working toward that goal. In September of 2018, military forces from both nations conducted Vostok 2018, a combined military exercise in Eastern Russia. It featured more than 300,000 troops, 36,000 military vehicles, 1,000 aircraft and 80 ships was the biggest Russian military exercise since the Cold War. Adversaries banding together against the U.S. is certainly not new, and veteran Washington politicians, like Senate Intelligence Committee Chair Richard Burr, are not surprised. There is already ample evidence that Russia and China individually are pouring resources into attacks on the US here in the homeland. Recent arrests and indictments of nationals from both countries suggest there’s been a recent wave of new activity. But a top FBI official says this is actually a part of a sustained pattern of activity. “In my opinion I believe the FBI feels strongly that it’s not that Russia and China have been raising the bar, they raised the bar several years ago, ” said Nancy McNamara, an assistant director at the FBI’s Washington field office. McNamara indicated that the Russian and Chinese intelligence operations used to attack the U.S are unique, persistent and often very effective. “We are already behind the curve so to speak. Both have very strong presence in the United States. Both have different types of operations and agendas,” McNamara said. The arrest of former American University student and Russian national Maria Butina, who plead guilty to acting as an illegal agent of the Russian Federation in the U.S., unveiled a more sophisticated, stealthy Kremlin approach, which was to attack the U.S. from within. National Security officials say in addition to threats from old adversaries like Russia, China, North Korea, Iran, relatively new transnational terrorist groups and non-state actors are now armed with emerging technological capabilities and poised to attack the U.S. individually or together. Burr says the U.S. needs to be prepared for almost anything. The most important and likely target is the 2020 presidential election. “We assess that foreign actors will view the 2020 US elections as an opportunity to advance their interests. 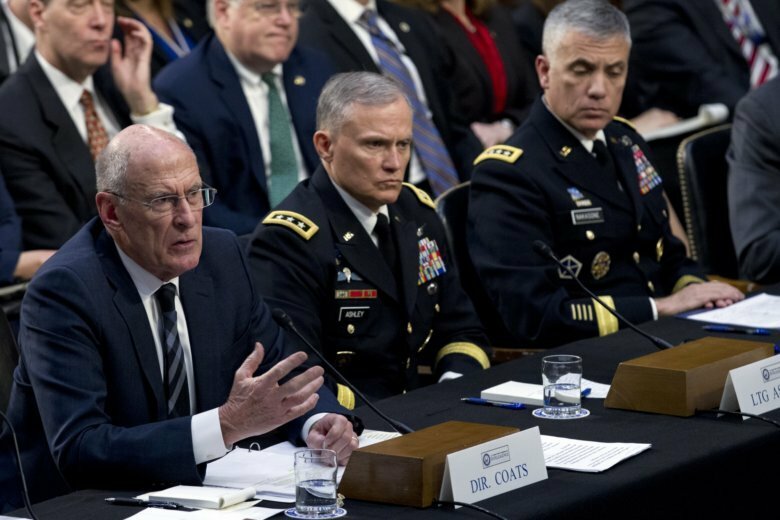 We expect them to refine their capabilities and add new tactics as they learn from each other’s experiences and efforts in previous elections,” said Coats. Staying ahead of the threats, according to Coats, follows three paths: integration, innovation and transparency. “You must be integrated to harness the flow of talent and tools from across the intelligence community. We look for innovation to make us more agile so we can swiftly take the right people and the right technology and use them efficiently to advance our highest priorities. Through transparency, we will strengthen Americans’ faith that the intelligence community seeks the truth and speaks the truth,” said Coats.